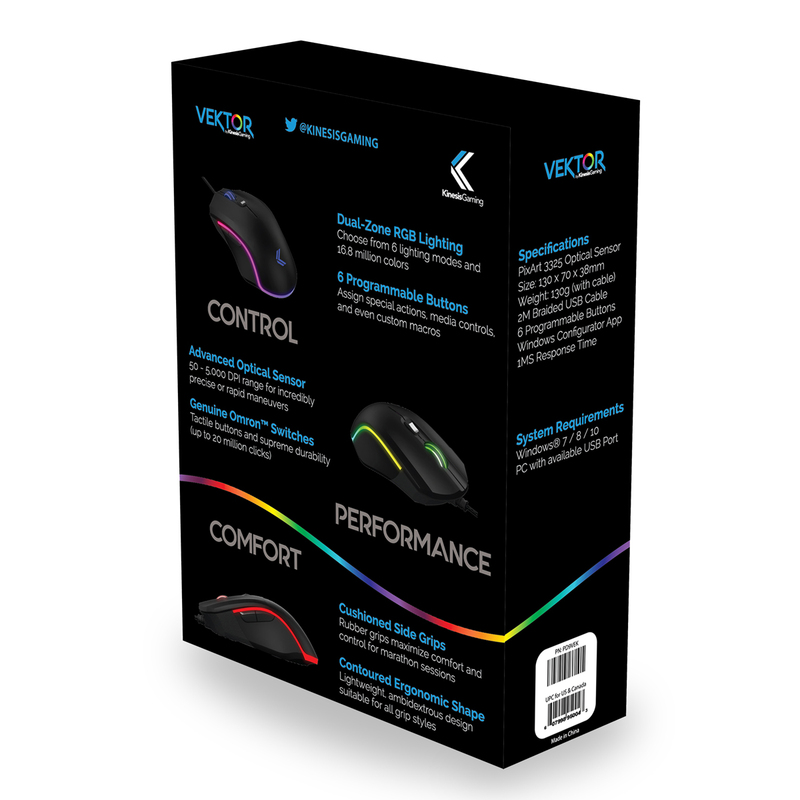 The Vektor RGB Gaming Mouse offers numerous performance features for a superior gaming experience. A competition grade sensor provides tracking from 50 to 5,000 DPI and top quality Omron® switches ensure rapid and reliable click response. All 6 buttons are fully programmable. 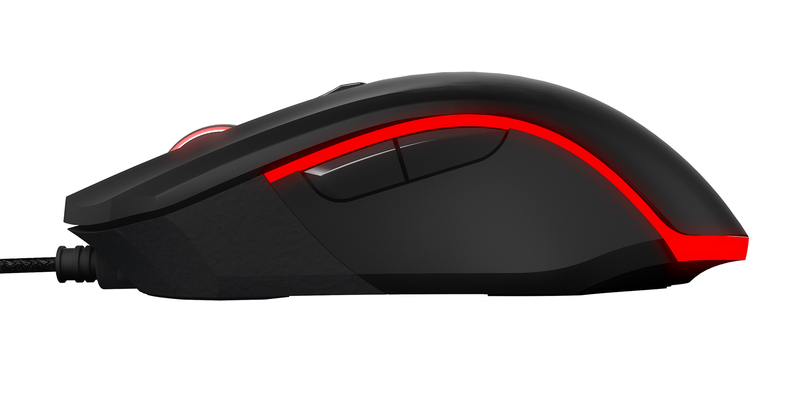 Using the Configurator App users are able to create up to 5 custom game specific profiles, optimizing performance with custom control layouts, shortcuts, or macros. 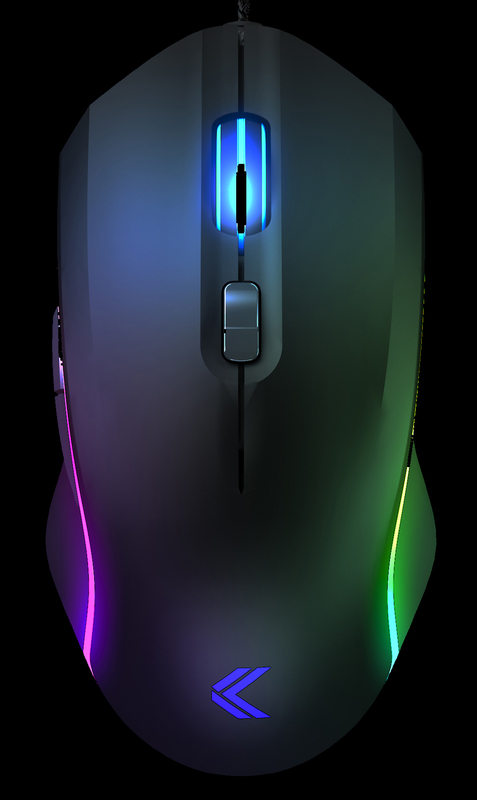 For the finishing touch, customizable multi-zone RGB Lighting effects let each user create their own unique look. 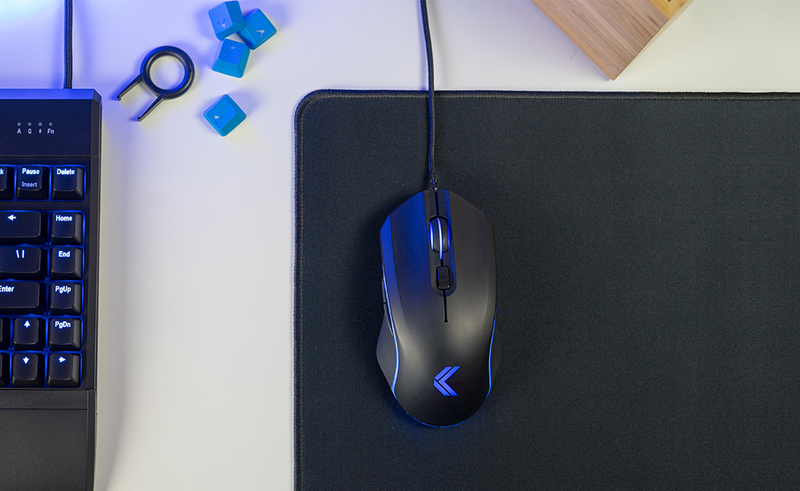 With 16.8 million colours to choose from, there is no limit to what can be done. The Configurator App for Windows puts the user in control. 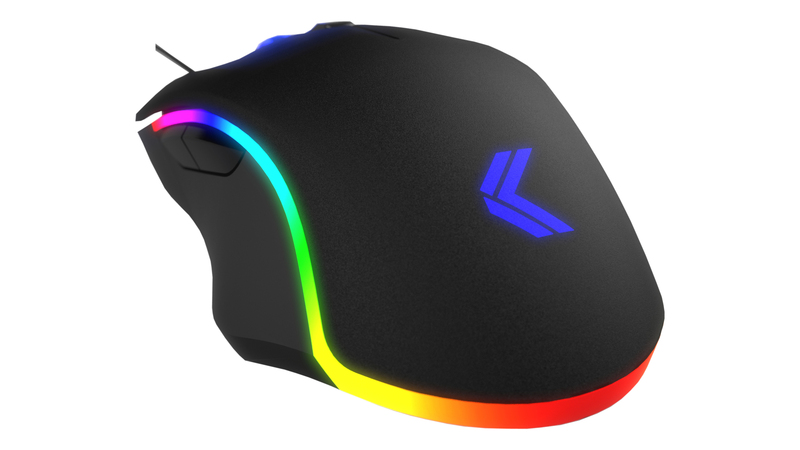 All settings, custom shortcuts, hotkeys, reassignment and custom colour settings are easily accessed through the graphic interface. Multiple colour effects are available in addition to user's being able to choose their own custom look. 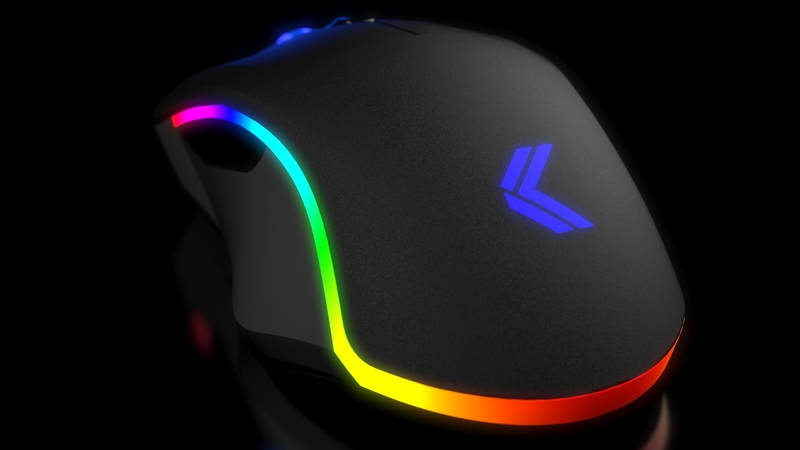 The "Loop" mode generates a continuous "flow" of coloured light around the body of the model. 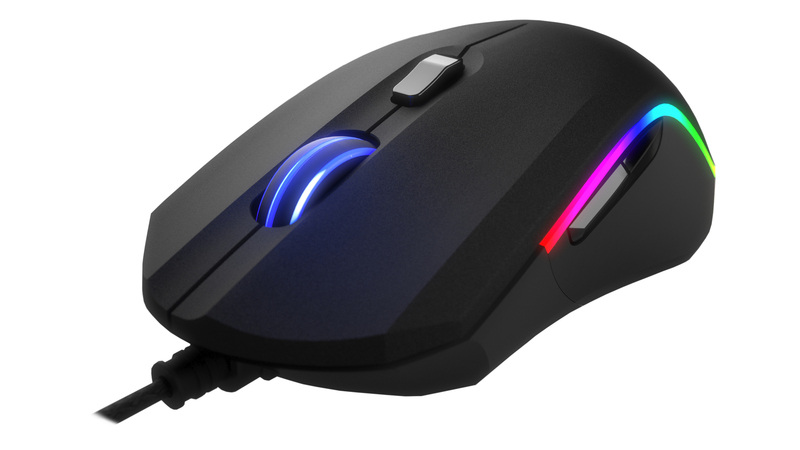 the Scroll Wheel and Log on the top of the mouse can be adjusted independent of the light strip around the body, further enhancing the look of this mouse. 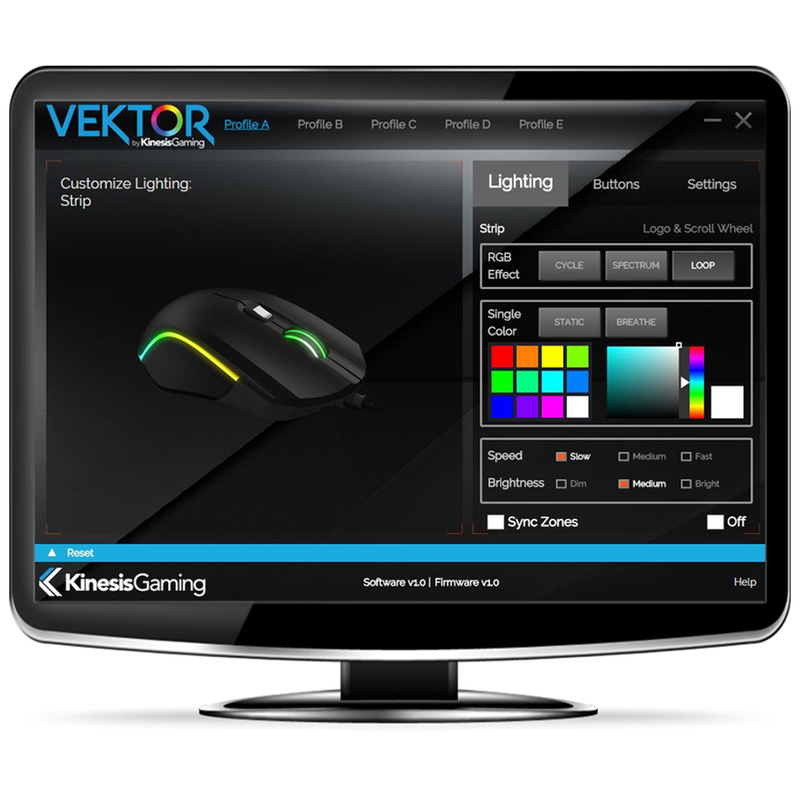 All 6 buttons on the Vektor can be custom-programmed to meet specific demands. 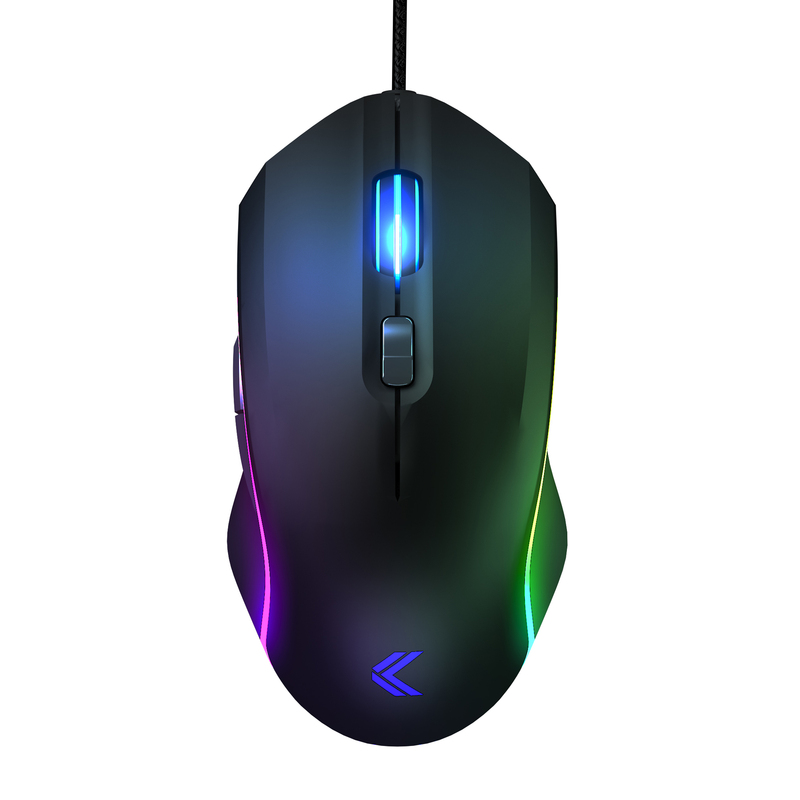 Personalized Acceleration and Scroll Speed. The Configurator App offers users the ability to set personalized acceleration and scrolling performance. 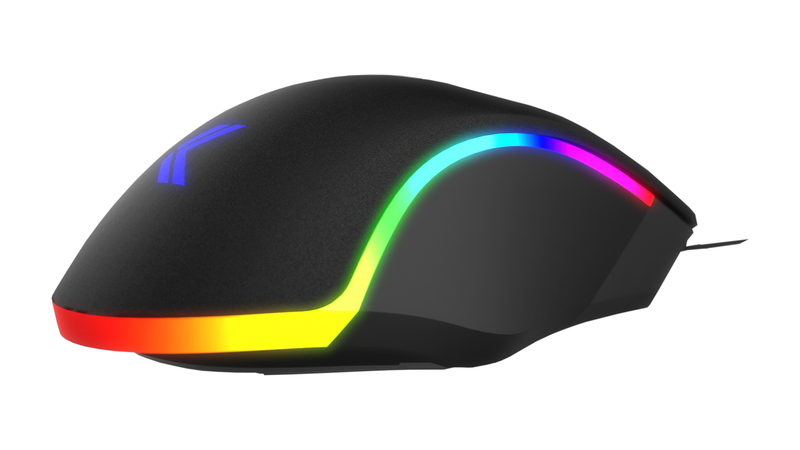 The Vektor Mouse is equipped with a gaming grade sensor capable of reading from 50 - 5000 DPI. Default settings of 500, 1000, 2000, 3500 and 5000 are available with the option of using the Configurator App to create custom settings accurate to a single unit. The genuine Omron® switches are rated for 20 million clicks. Users can choose the polling rate that best serves their needs. Adjustment is through the Configurator App. 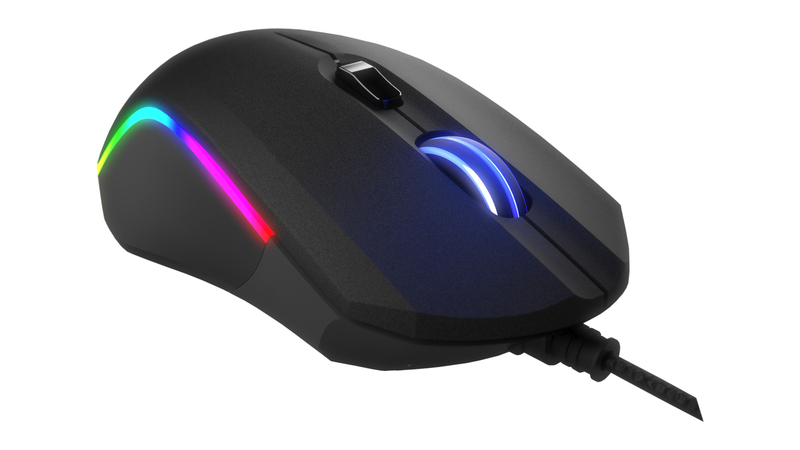 The Vektor RGB Gaming Mouse is equipped with a heavy duty braided cable to ensure durability and performance. 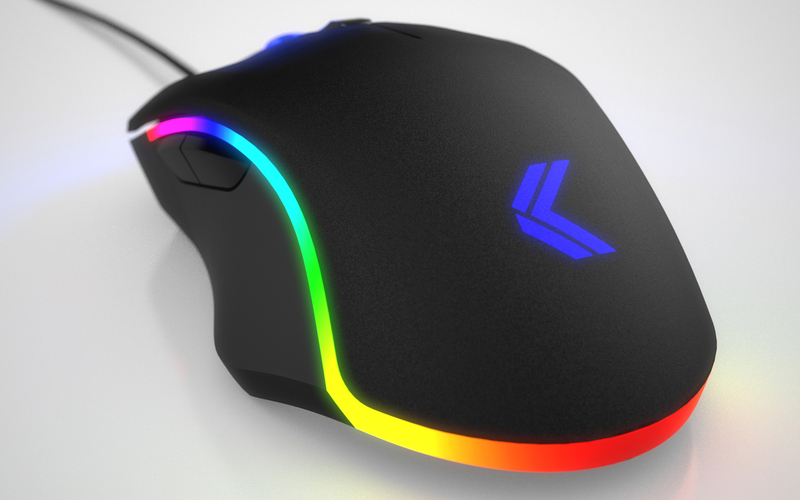 Lightweight Design The Vektor RGB Gaming Mouse weighs in under 100 grams (without cord). 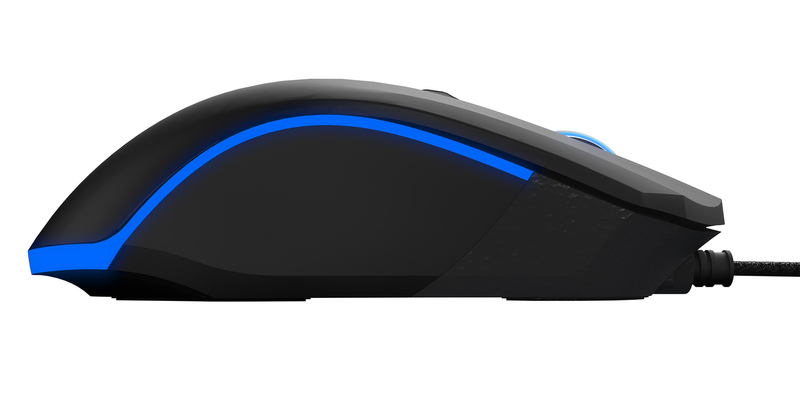 The light weight reduces the effort required to move the mouse and facilitates quick reaction times. 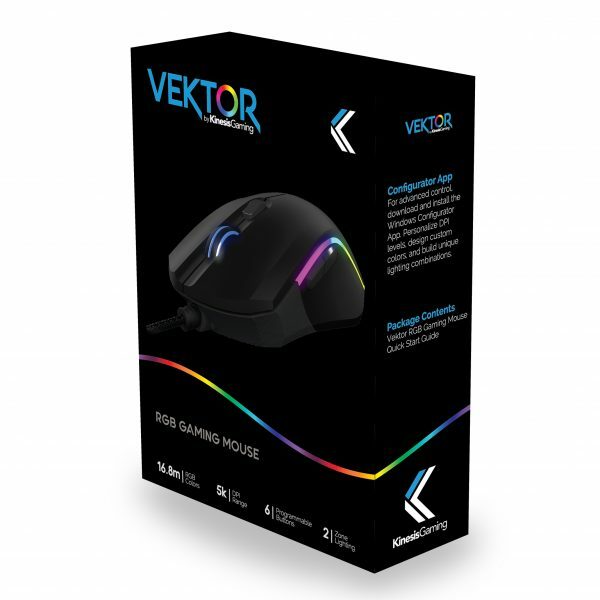 Regardless of how you hold a mouse, the Vektor Mouse will accommodate. 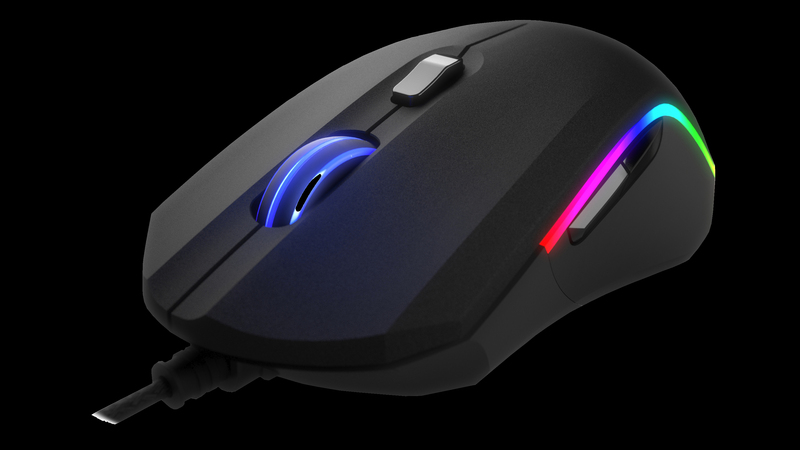 It is compatible with claw, fingertip, or palm grips. 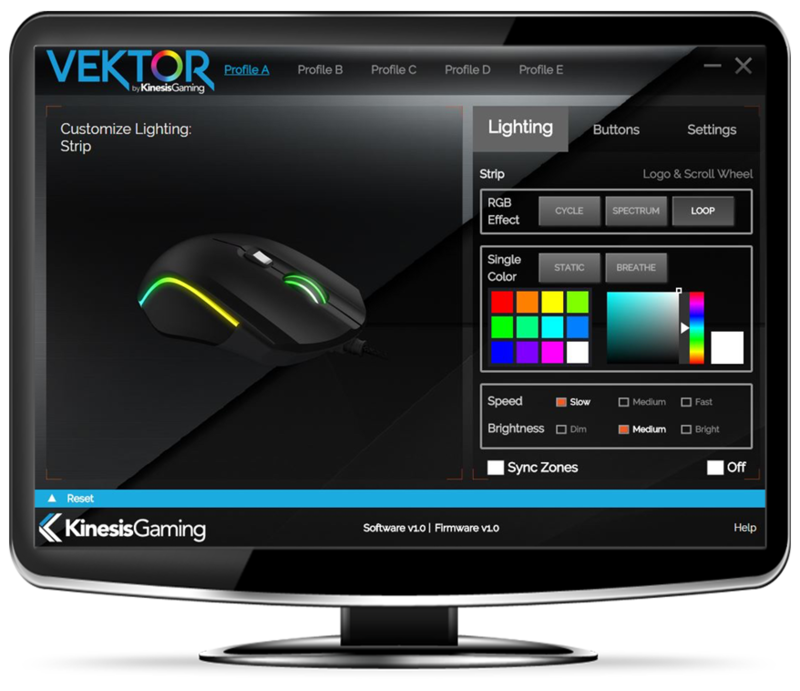 Programmability: Configurator App (Windows only) offers full button configuration and lighting control.